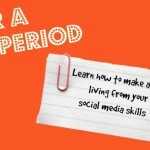 I am proud to announce the launch of my first eBook – How to Make a Living from your Social Media Skills. It is exclusive to Amazon Kindle until at least 2016, and is available in the UK for £2.99. Be sure to check out the five-day free period from Saturday 3rd October, and if you do manage to bag yourself a free copy and enjoy the book, please could you be so lovely as to rate it on Amazon?